Sometimes the Red Shirt protests seem downright surreal. Today it was a four minute span at the rally in their main camp in Ratchaprasong intersection. The Red Shirts always try to provide top notch entertainment for their followers. Usually it’s Thai country singers who perform the music of Isan. The crowd eats it up, dancing and swaying to the music and using their clappers to amplify the percussion. Sometimes it’s something different. That was the case this evening. A “ladyboy” took the stage and started lipsynching the Gloria Gaynor classic and feminist anthem “I Will Survive” and the crowd went wild, including two Muslim women in the first row (including one in a red hijab who I doubt was even alive when Gaynor recorded the song) and started cheering and singing along. 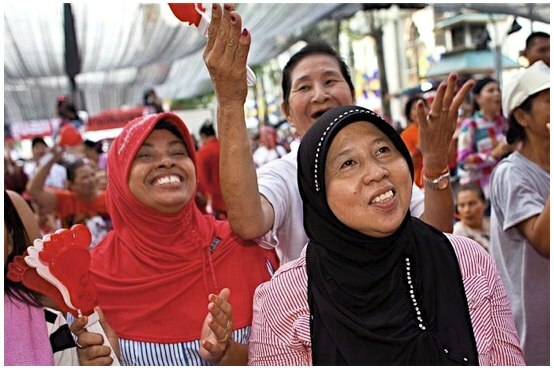 There aren’t many Muslims in Thailand. The Kingdom is well over 90% Buddhist and most of the Muslims live in the violence plagued south. There are even fewer Muslims in the north, the Red Shirts’ heartland. So there are few Muslims active in the Red Shirt movement. But somehow these two managed to get the front row and really get into a 1970’s feminist anthem from the US. Just another day in Bangkok. There are more photos of the Red Shirts in my PhotoShelter archive and available from ZUMA Press.